This past Sunday many of our members braved the weather and attended our FVMBA Annual General Meeting (AGM), where we had the opportunity to celebrate a fantastic year. 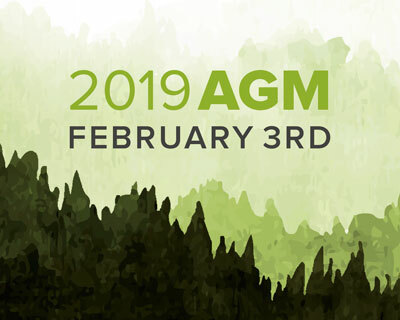 If you missed the AGM, don’t fret — we will highlight the details for you here! Our FVMBA Board President, Rocky Blondin, kicked off the AGM by acknowledging the shared traditional ancestral territory for our meeting location of the Sumas First Nation, Kwantlen First Nation and Matsqui First Nation, including all the Sto:lo Communities – the “People of the River” and sought to reaffirm our commitment to our role as stewards of the trails with great honor and humility, alongside our local First Nations who are stewards of the land. And our 900+ strong members! It’s to our members, builders, and supporters that we owe the credit as they continue to make it all possible. In 2018, we hit record-breaking membership, revenue generation, and trail operational investments, including tools, tents and training for our builders, directors and staff. 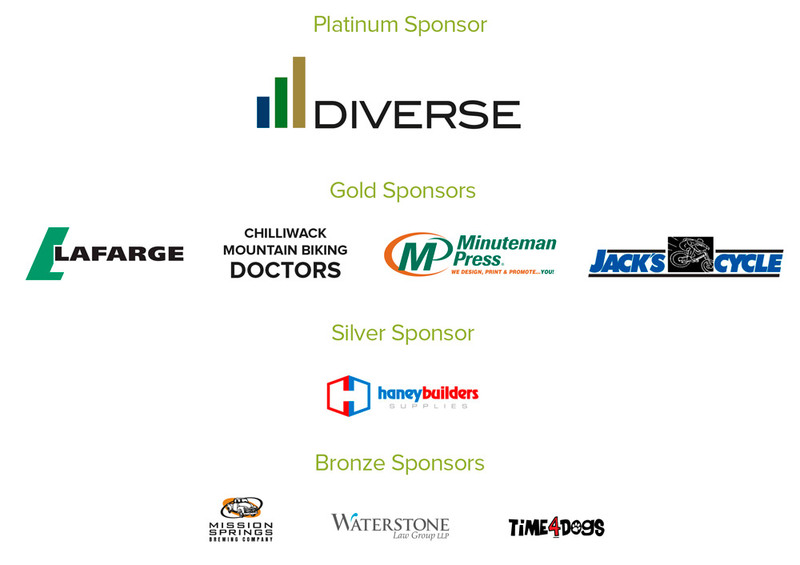 We continue to work with our existing sponsors and have found many new sponsors that we hope to have a long-lasting relationship with, including our Platinum Sponsor, Diverse Properties! A few of the major events that have taken place over the last year include the Social Series rides that were great community events, enjoyed by many throughout the region. The Vedder Mountain Classic SOLD OUT — AMAZING! And our “new kid” on the block, the Bear Cub Kids Race, was a hit amongst the little rippers. We also accomplished a lot through community trail days and maintenance efforts. We even received an Award from Mission’s Mayor & Council for voluntarily clearing the trails after the storms. 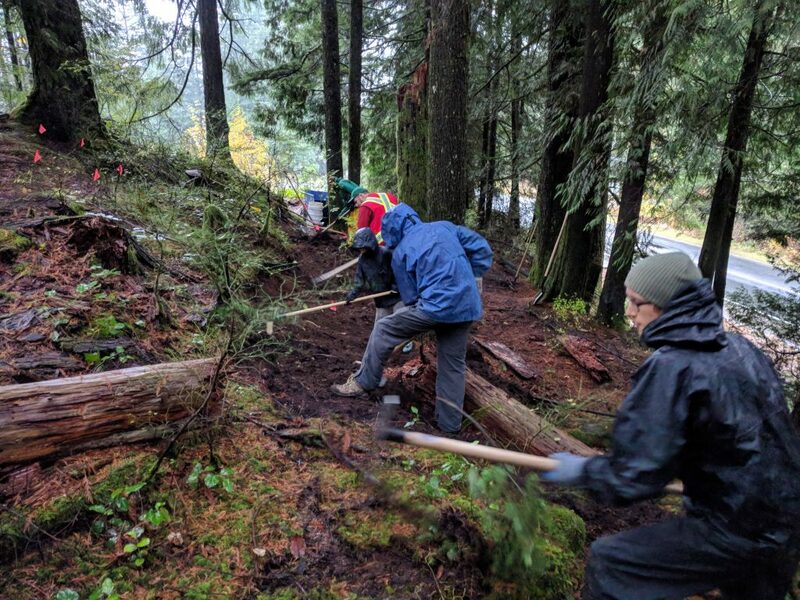 Many of our builders continue to work alongside the Chilliwack Park Society in the development of the Chilliwack Community Forest, which is an area where beginners and advanced riders can still have fun. Another community project supported by the District of Mission Forestry, Tourism and Parks & Recreation Departments, as well as IMBA, is the Mill Pond Skills Park at the base of Bear Mountain. We hope that more of these parks can be supported throughout the Fraser Valley! Our members have also taken an active role in the protection and expansion of our trail network and the sport of mountain biking as a whole. Board Members Mike Woods and Rocky Blondin met with an eager crew of MTB people in Hope to help them get started in their region. We also can’t look at the past year without acknowledging the dedication it took for all those involved when Sumas was SAVED! We would like to extend a heartfelt thank you. You have provided a gift for future generations to come. Another major event this year was our approval of the Section 56 for the establishment of the Vedder Mountain Interpretive Forest. 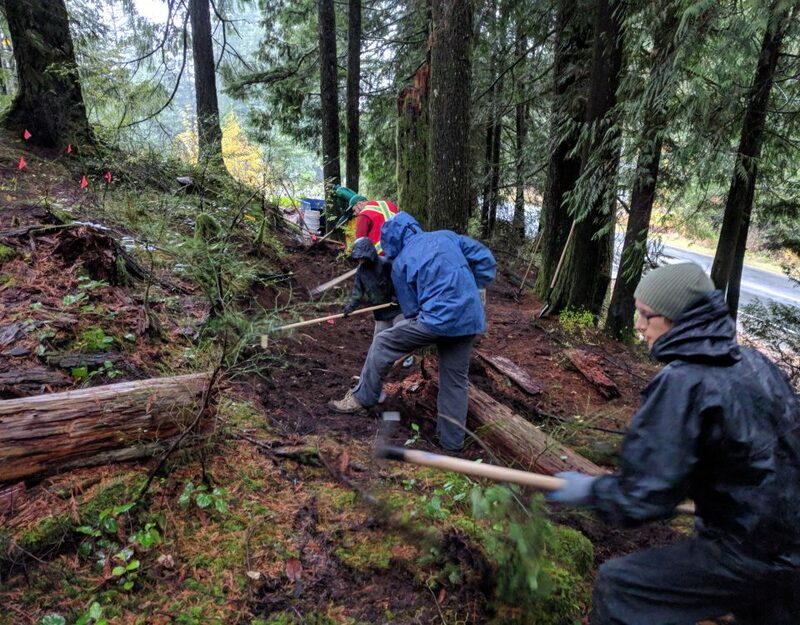 This means that we have what is considered a “recreational polygon” which will ensure the sanctioning and legalization of our trails, as well as an expedited approval process for new trail development and ongoing maintenance. This is HUGE! If you’d like to learn more about the history and legalization process that has been ongoing since 2005, head over to read Past President and our current Director of Advocacy, Ernie Kliever’s, post here. As part of our role, the FVMBA strives to provide lifelong learning opportunities to its members. We feel that knowledge and experience is vital to a successful organization and to continue to act as stewards of the trails. Over this last year, we took that passion and saw many of our FVMBA Board Members attend the NSMBA and IMBA Canada Western Conference on Building Diversity in Mountain Biking. In addition, the FVMBA Board hosted an Aboriginal Engagement Workshop with Patrick Lucas of the Youth Mountain Biking Program. As a benchmark of our success, Mark Sawatzky, our dedicated FVMBA Treasurer and Accountant, provided a snapshot of our financials. To say the least, we have had an unprecedented year as our membership has increased drastically, which in turn has provided substantial opportunity for our organization to expand its capacity through increased social events, trail maintenance and development, and training programs for a start. The following financial statements and 2019 Budget was approved by our members at the AGM. Click here to download the financial statements: FVMBA 2017-2018 Financial Statements & 2018-2019 Budget. Our thematic goal for 2019 is (re)Building Bridges — both physically and metaphorically speaking, in terms of bringing our infrastructure up to current safety standards, as well as bridging relationships with our various stakeholders. In addition to bridging these gaps, we have a number of new goals that we would like to achieve alongside some of our recurring ones. First up, we would like to continue hosting successful race events this year, including the Vedder Mountain Classic and the Bear Cub Kids Race. The Vedder Mountain Classic will be hosted on Saturday, May 11, 2019 and spots are filling up fast so be sure to register now! As a continuation of our success last year, we would like to enhance our Social Series and encourage people to attend rides in all areas, not just their usual riding area. This year we will be coordinating Social Rides so that an event will be hosted on a rotating schedule throughout each region. We are excited to provide greater opportunity for our members to explore more of the Fraser Valley! Additionally, we are looking to recruit a new staff member for our upcoming Operations Manager position. Our organization is burdened with great amounts of paperwork and process in order to build and maintain trails. Hiring an Operations Manager will enable us to get more shovels in the ground and to do so effectively and safely. We are also looking to host more building training and riding skills workshops for our members. At this time, we are scheduling a chainsaw safety workshop in April (details to come). Make sure you check our Events Calendar on our website regularly for upcoming training programs, social rides or workshops. Another exciting announcement to make is with respect to our new social media and communication strategy. Board Members Julie Henderson and Emma Kliever stepped up to the plate, and together with Sarah Elias of HiWire Creative, developed a new Communications Strategy and Brand Standards Guide. As part of this process, FVMBA Board of Directors appointed Julie Henderson to a new role as Director of Communication and an FVMBA Communications Team was formed to manage the rollout. Our Communications Team will work on delivering messages to our members on a more consistent basis and aim to provide high-quality content in order to continue building relationships with our mountain biking community and beyond. Do you have something to share? Email your photos, stories or requests to [email protected] to help us spread the good word and showcase your adventures! Last but certainly not least, we would like to acknowledge our team of volunteer directors and representatives. This year two of our existing Board Members are stepping down to move on to new and exciting ventures — Chelsea Cromarty and Crystal Lambert. You have both served the FVMBA and its membership so well and we would like to extend our gratitude and appreciation for all you’ve done. Good luck out there — you’ll always have a seat at our table. With this transition, we would also like to welcome our two new Board Members who will round out our team for 2019: Darren Durupt (Maple Ridge) and Daryl Saynor (Abbotsford). So without further ado, meet your new FVMBA Board of Directors and incumbent Area Representatives. Thank you again to all who attended. We look forward to seeing you again next year at the AGM — but hopefully even sooner as we head out on the trails! A hat tip to Roger Friesen and UFV’s Banff Film Festival for donating proceeds of the festival to FVMBA! And a BIG thanks to all our sponsors! sorry i missed it but excited and thankful for all that’s going on!